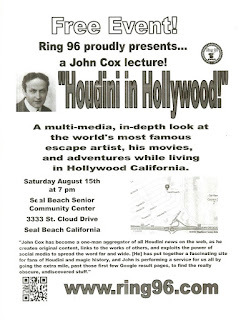 Last night I had the extreme pleasure of giving my "Houdini in Hollywood" talk at the monthly meeting of the historic IBM Ring 96 in Seal Beach, CA. I'm happy to report that the event was a big success. I've never felt more relaxed giving this talk, and Ring Vice President Cliff Gerstman ran a tight meeting and everything timed out beautifully. The Ring organizers told me this was one of their best attended events, and I was especially happy to see some young people in the audience. I really wasn't sure if teens and preteens would put up with over an hour of silent movie footage and a lecture about a man who has been dead for 89 years, but they were fully engaged from beginning to end, and even came up and asked me questions during the intermission. Yes, there's definitely going to be a next generation of Houdini nuts! With special permission from Park Circus Films, I was able to screen clips from TCMs newly restored The Grim Game (the jail break and suspended straitjacket escape). The group seemed to really enjoy this. The young people were especially impressed with how Houdini rolled under a truck and rode it away. But the clip that seemed to resonate the most was Houdini's card manipulation short, Velvet Fingers. Made within a year of his death, it remains his most haunting piece of film. The magicians in the room also appreciated this evidence of Houdini's card skills. Ring 96 holds meetings on the third Saturday of every month. They feature lectures, competitions and other exciting magic based events. I encourage you to bookmark their website and attend their meetings which are always open to the public. I also encourage you to check out Cliff Gerstman's website T.I.E.S. (The International Escapologist Society), and his monthly e-newsletter, The Chainletter, which regularly runs news and features on Houdini. For this event, I extended my talk by 20 minutes, and I think I found the perfect length and combination of clips. Unfortunately, I don't have any current commitments to do the talk again. But I will be giving an all-new lecture on Houdini's spirit busting activities at the Center For Inquiry in Hollywood and Costa Mesa in October. This new talk is called "Houdini Among The Spirits." I'll post more details soon. 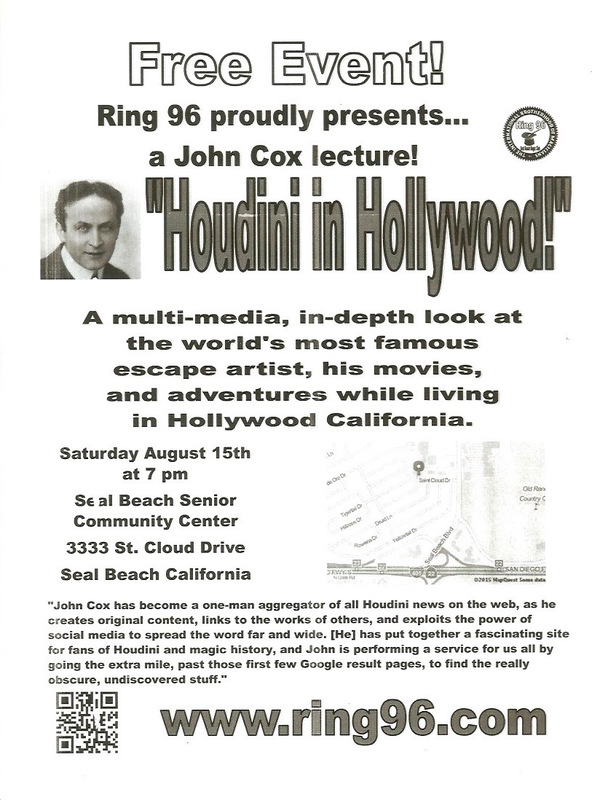 Thanks again to Cliff Gerstman and all the members of Ring 96 for the warm reception and for letting me bring Houdini to Seal Beach. Well done. Nice to hear that there were teens in the audience who were entranced. Houdini's fame will endure for at least another generation. They were great. There was one little girl much younger than a teen. I really thought I might lose them at intermission, but they actually seemed the most interested of everyone there! They also loved looking at the Houdini artifacts I brought along.